Perfect for any Reese's lover... with a molten peanut butter center! 2.) In a small bowl combines all oatmeal ingredients BESIDES the peanut butter. 3.) Spray a small oven-safe dish and pour in mixture. 4.) Take the peanut butter and drop it into the middle. Push down! 5.) Bake for 25 minutes. I then raise oven to 400 and cook for 10 more minutes. I like mine crusty on top, this isn't needed if you like yours differently. 6.) 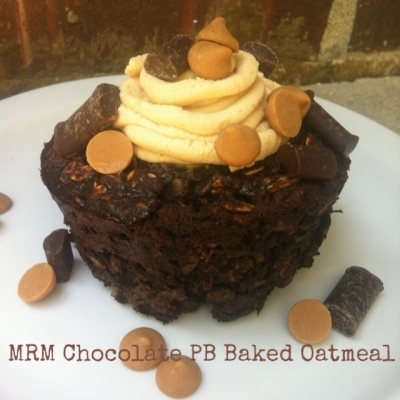 Mix the topping ingredients, top oatmeal, and enjoy! 390 calories, 16 grams fat, 47 grams carbs, 22 grams protein, and 6 grams fiber! WITH the chips on top!